Watch the broadcast of night two of the KS Hawaiʻi Hōʻike 2019 - The Battle of Kuamoʻo, a Hawaiian opera. The broadcast took place on Friday, March 15. 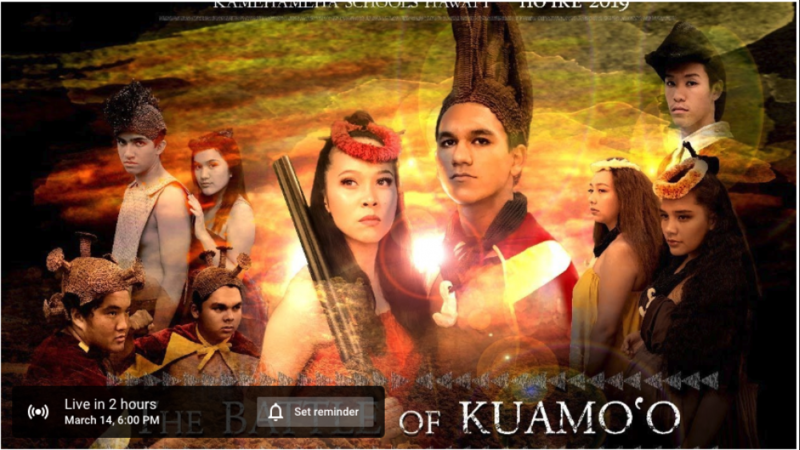 The Battle of Kuamoʻo, a Hawaiian opera was the featured moʻolelo of this year's Hōʻike. Digital media haumāna ran the broadcast live on the Lehua TV YouTube channel. Lehua TV once again provided a live broadcast of Hōʻike for audiences who could not be here in person. Whether you want to watch Friday's performance (above) or Thursday's performance (below), both performances of the Battle of Kuamoʻo are now available for on-demand streaming on their YouTube channel. The broadcast was run by kumu Nader Shehata's digital media students. Each year, Hōʻike aims to share significant moments in Hawaiian history. This year's production highlights a pivotal moment for our Lāhui, as modernism and traditionalism battle and the ultimate sacrifice is made for one's beliefs. The story is especially significant as this year marks the 200th anniversary of the death of Kamehameha Paiʻea and this historic battle, which took place on Hawaiʻi Island on the Kona side of the island. Read our story on the show for more information. To make sure you don't miss future events, you can subscribe to the channel and set a reminder to get an alert when they go live. Watch the broadcast of the Thursday night performance of The Battle of Kuamoʻo, a Hawaiian opera that is the featured story for Hōʻike 2019. 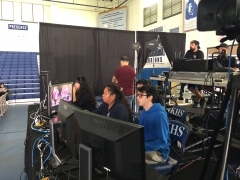 A student team ran the broadcast on Lehua TV. The 16th annual Kamehameha Schools Hawaiʻi Hōʻike will feature the Hawaiian opera, The Battle of Kuamoʻo, on March 14 and 15.